Upon review of my other website discussion "Motor/Sailing Design" written back in 2001, one paragraph jumps out at me, "The modern catamaran motorsailer is blessed with such a dramatic improvement in performance, that I have chosen to redesignate it 'Motor/Sailer' to differentiate, and yet emphasize its motoring and sailing capabilities. Those expedition yacht seekers of today should give serious consideration to this type, and take a look at what's coming in future motor/sailers." I now want to present one of those future designs! The DynaRig is a modern version of a 'square-rigger', but here the yards (yardarms/horizontal spars) do not swing around the fixed mast, but rather are attached permanently to the mast which is allowed to rotate to engage the wind angles. This requirement for a rotating mast precludes the old traditional staying of the mast, and results in a 'free-standing design'. Only recent developments in very hi-tech materials such as carbon fiber have permitted this DynaRig technology to be become reality. The German research had determined the optimum arc for the square-rigger's yardarms & sails to be effective pointing to windward. This 12.5-degree arc was reconfirmed by the Maltese Falcon design team. Much like the old square-rigs the total sail area on one mast is divided into rectangular panel sections 'stacked' on top of one another. Even the old names designating the different sails have been retained; the Courses on the bottom, then the Topsails, the Gallants, and finally the Royals. The individual rectangular panels can be sized proportionately to account for the desired sail area to be deployed for various wind conditions. Naturally the upper sails that can exert more overturning forces are smaller in size. I've chosen to make the 'courses' smaller than the 'gallants' for storm purposes. But I kept the yardarms of the 3 lower sails all the same length for manufacturing reasons. **Very interestingly the overall profile of this sail plan almost perfectly matches that of the idealized semi-ellipital/parabolic planform shape. The lift/drag factors for this optimized shape are so much superior to those for the triangular sail-shapes of the Bermuda rig. Doyle Sailmakers was employed to test and build the sails for Maltese Falcon. They discovered that when angled efficiently the square sails suffer very low loading due to the very extensive 'square edge support' provided by the yardarms. "In 50 knots of wind no more than 900kg loading was measured, tiny compared with leech loads on far smaller 'conventional' rigs." So simple Dacron can be used to good effect, in fact only 4 oz cloth in most of MF's rig. Non-heeling multihull vessels (particularly catamarans) experience difficulties keeping an 'aerofoil-shape' or 'flying shape' to their sails in light-wind conditions. But with light-weight sail cloth stretched between horizontal yardarms, the flying shapes can be better maintained. Even in heavier conditions the flying shapes will remain almost constant. Reefing this DynaRig is done progressively from the top down. On Maltese Falcon it was found that the 'royals' themselves (those right at the top) accounted for 40% of the loads on the rig, and with those furled her angle of heel reduced dramatically. The overturning moments on our Dyna-rigged multihull should act accordingly. It might surprise you that the 'royals' on Maltese Falcon are constructed of remarkably light 2 oz Dacron, and are "effectively sacrificed in 80 knots of wind." In other words, it will allow 'blow-out protection' in microbursts and/or unseen severe squalls. Reefed all the way down leaves just the 'course' sails flying. It has a very low CE at this stage, and like all of the other reefed configurations, it remains a 'balanced' sail plan. The course sail still presents a sizable sail area for really heavy-air storm conditions. An ultimate storm trysail arrangement is contemplated where the luff of this sail would ride in a slotted track mounted onto the rear facing outside wall of the mast tube, and then sheeted to the boat. Coincidently there is the possibility of two 'crow's nests' on the upper yardarms whose visibility would depend upon the stage of reefing employed. That slotted track for the trysail could be complimented with another, and the pair could provide a guideway for an 'elevator ride' to the crow's nest(s) with the help of an electric winch. On Maltese Falcon the sails roller-furl into a cavity in the body of the mast. I believe there is a design variation that will avoid this very extra complication, while concurrently allowing for a sealed mast tube. about a foot more than that deemed necessary by the free-standing Aero-rig manufacturers. The 'spaceframe' bulkhead is patterned after Shuttleworth's FEA research on an Aero-Rig catamaran design. Carbon rib-arches incorporated into the cabin top are also envisioned. Full automation is anticipated, but expected to be quite a bit less complicated than that of Maltese Falcon. Single-handed sailing is a reality. The auto-winching associated with sail handling will be done electrically, and might require less hardware than on MF. The mast rotation gear is accessible and located in a big compartment at the front of the cabin/saloon structure. This rig in its 'bare' state still represents a lot of windage. In a storm, or at anchor, this sizable windage factor located forward of the CLR of the vessel could cause the bows to be pushed off the wind to some considerable degree. For this reason the 'radar arch' has been fashioned bigger than would seem necessary to act as a stabilizer at the rear. It's ironic that this arch is there at all, as I swore a long time ago I did not like these things! I've tried to keep the 'flybridge' control station's drag at a minimum by utilizing a 'podium type' console, and a simple canvas top cover. To compliment this futuristic DynaRig sailing rig, I offer a couple of innovative solutions to the motor power options. I will cover these in an outline form, and more completely in the "Power Propulsion" section. A) Rim-Driven Propellers: Instead of propulsion blades being attached to a central hub and propeller shaft, they are rooted to the rotating inner rim of a circular nozzle type unit. The rim is electrically driven with a permanent magnet motor, where the motor windings are in the stator and where the rotor has a number of permanent magnets. The electric motor is an integral part of the 'propeller nozzle'. These units are cutting edge technology. First came the rim-driven thrusters, and very soon the rim-driven propulsers. No reduction and direction gearboxes required, instant fwd/reverse !! Conventional propeller propulsion could be augmented with Steyr engine/generator combo-units to dispense with auxiliary generators. Long slender hulls are a key factor to efficiency of the catamaran vessel. This is usually expressed as a 'slenderness ratio'. It is best that this slenderness ratio not slip below 12-to-1, even for our motorsailors. Heavier-displacement, modified Malcolm Tennant (CS) 'canoe-stern' type hull will tack slower, but carry a bigger load. Approx 48-50.000 lbs. The CS hull form is depicted with an outdrive-leg propulsion unit. Alternatively, this could be a rim-drive unit, or even a conventional shafted- prop arrangement exiting the 'canoe area' of the hull per existing designs. Both hull types would make use of an 'anti-squat' lip at the stern, akin to a built-in trim tab. The central portion of the aft deck can be lowered to the sea level. This might be advantageous to the fisherman or for family entertainment zone. There are two possible crow's nest on the mast at the second and third yardarm locations. These might be serviced by an 'electric lift'. 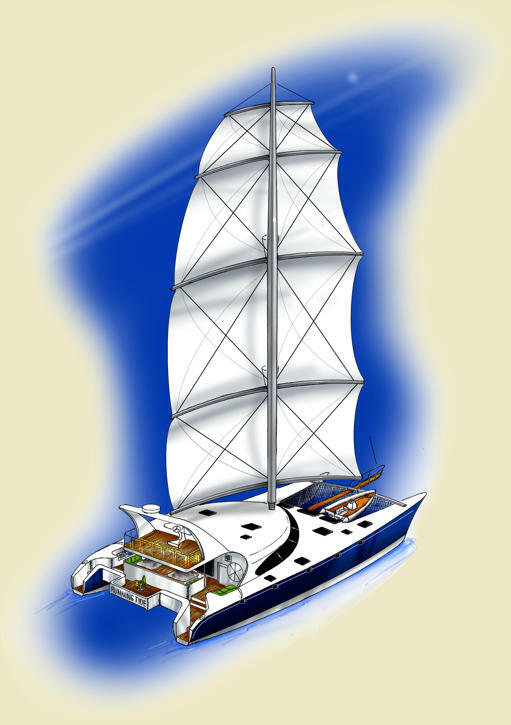 With just a little bit more mast rotation, the lower yardarm can be utilized as a crane to launch and retrieve the yacht's tender(s) to be stored at the bow location. In many cruising locations your tender assumes the role of your car, so having two onboard is very convenient when there is a group of people aboard. I have designed a custom RIB that would survive this bow location, and offer significant other features of performance and carrying capacity. This could be a real fuel-sipping machine requiring less fuel weight to haul and propel around, or seek out in remote locations. Demonstrated savings can reach 30-50%. She could skim over depths as little as 4'. Explore those rivers, mangroves, coves, lagoons. Dive or fish the flats and the reefs from the Bahamas to the Pacific atolls.